﻿ Fun Easy English - Environment - Global warming - Climate change Indicators: Antarctic Sea Ice. This indicator tracks the extent of sea ice around Antarctica. Antarctic sea ice extent in September and February has increased somewhat over time, although the most recent year was below average. The September maximum extent reached the highest level on record in 2014—about 7 percent larger than the 1981­–2010 average—but in 2015 it was slightly below the 1981–2010 average. 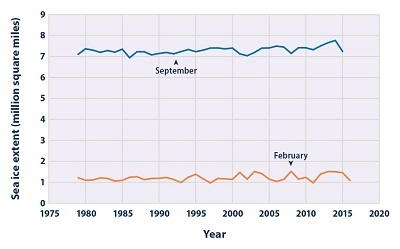 As for February extent, 2013, 2014, and 2015 were three of the six largest years on record, but extent in 2016 was about 9 percent below the 1981–2010 average (see Figure 1). Slight increases in Antarctic sea ice are outweighed by the loss of sea ice in the Arctic during the same time period (see the Arctic Sea Ice indicator). Overall, the Earth has lost sea ice at an average rate of 13,500 square miles per year since 1979—equivalent to losing an area larger than the state of Maryland every year. This decrease affects the Earth’s energy balance. The Southern Ocean around Antarctica freezes to form sea ice every year. This sea ice reaches its maximum extent in September or early October, around the end of winter in the Southern Hemisphere. At that point, virtually the entire continent of Antarctica is surrounded by a ring of sea ice (see images below). The ice melts in the summer months (December to February) because of warmer temperatures and long hours of sunlight. Unlike the Arctic, where a large area of sea ice lasts year-round (see the Arctic Sea Ice indicator), the sea ice around Antarctica is thinner and nearly all of it melts in a typical summer. 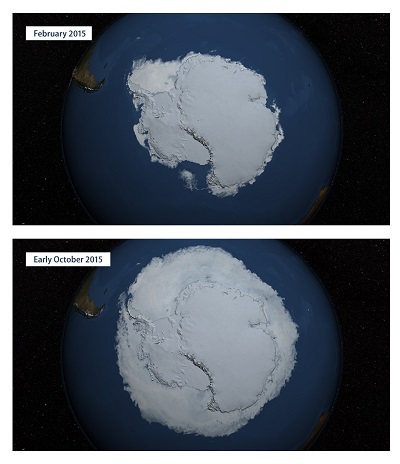 This happens because no landmass is present to stop Antarctic sea ice from breaking up and drifting northward into warmer waters, where it eventually melts. Like Arctic sea ice, Antarctic sea ice affects global climate, regional climate, and ecosystems. Because ice is more reflective than liquid water, it plays a significant role in maintaining the Earth’s energy balance and helping to keep polar regions cool. (For more information on how the color of the Earth's surface affects the absorption of sunlight, see the Snow Cover indicator.) Sea ice also keeps the air cool by forming a barrier between the cold air above and the warmer water below. 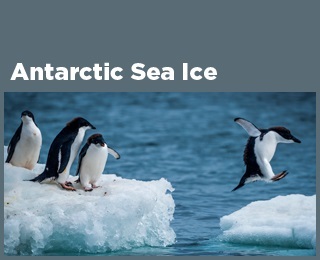 Antarctic sea ice is an important part of the habitat for penguins, seals, and other animals. Warmer air and ocean temperatures are generally expected to reduce the amount of sea ice present worldwide. While warming has already driven a noticeable decline in sea ice in the Arctic, extent in the Antarctic as a whole has not yet declined (and has actually increased slightly), which may reflect influences of wind patterns, ocean currents, and precipitation around the continent. Figure 1 shows Antarctic sea ice extent from 1979, when routine monitoring by satellites started, to early 2016. Sea ice extent is defined as the area of ocean where at least 15 percent of the surface is frozen. This threshold was chosen because scientists have found that it gives the best approximation of the edge of the ice. Data are collected throughout the year, but for comparison, this indicator focuses on the months when sea ice typically reaches its minimum and maximum extent. February is typically when the sea ice extent reaches its annual minimum after melting during the spring and summer. The ice typically reaches its maximum extent in late September or early October after winter freezing, with the largest monthly average extent occurring in September. Data for this indicator were gathered by the National Snow and Ice Data Center using satellite imaging technology and data processing methods developed by the National Aeronautics and Space Administration. Unlike EPA’s Arctic Sea Ice indicator, this indicator does not show the age of Antarctic sea ice. This is because nearly all of the Antarctic ice melts every summer, unlike the Arctic, where a large portion of ice survives for multiple years. Compared with the noticeable decrease in Arctic sea ice extent (see the Arctic Sea Ice indicator), the increase in Antarctic sea ice is small. Many factors appear to be influencing Antarctic sea ice extent, including changes in wind patterns, currents, and precipitation. Without better ice thickness and ice volume estimates, it is difficult to characterize how the total amount of Antarctic sea ice is responding to climate change. The data for this indicator were provided by the National Snow and Ice Data Center. These data are also available online at: http://nsidc.org/data/seaice_index/archives.html. The National Snow and Ice Data Center produces a variety of reports analyzing sea ice data. This figure shows Antarctic sea ice extent for the months of February and September of each year from 1979 through September 2015 and February 2016. The minimum and maximum sea ice extent typically occur in February and September each year.